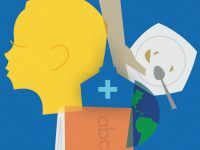 In the new report The Good News About Global Poverty produced by the Barna Group in partnership with Compassion, Barna polled U.S. adults on their beliefs about global poverty. 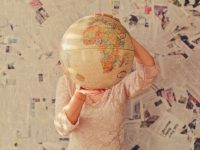 They dove into their perceptions regarding the state of global poverty, level of concerns for poverty, and belief in their ability to affect change. When the participants in the study were asked if they believe poverty is growing, shrinking or holding steady, it was clear that public understanding has not kept up with the changes in poverty. 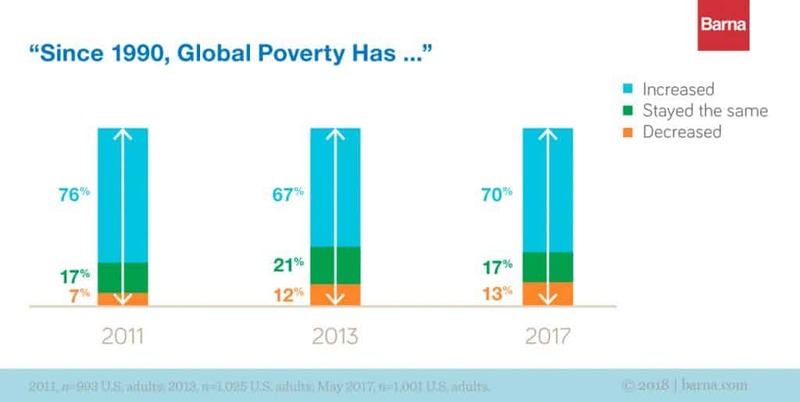 The graph below displays people who were polled between 2011-2017 and clearly shows that most people (70 percent) believe global poverty has increased since 1990. 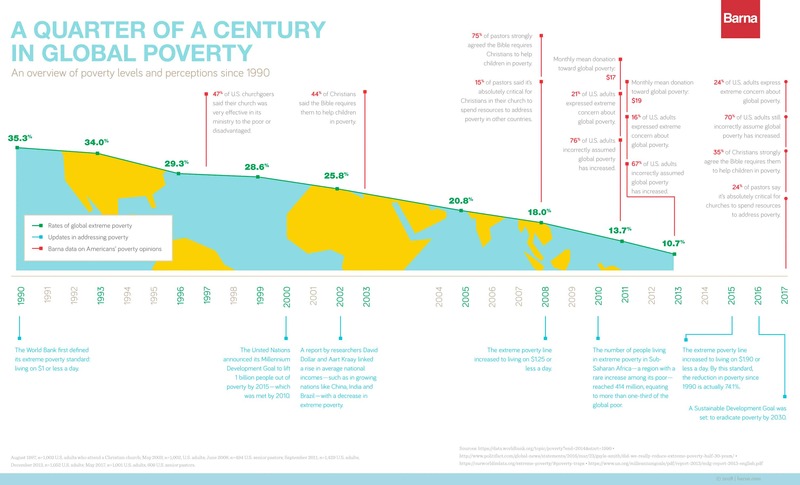 Extreme global poverty has fallen by 24 percent since 1990. Not only do 70 percent of people polled not know this great news, they actually believe the opposite has happened. In 1990, the world poverty rate was 35 percent. The United Nations’ Millennium Development Goals was to halve the 1990 poverty rate by 2015. The world did it by 2010! Since 1990, 1.1 billion people have been lifted out of poverty. Between 2012-2015 alone, there was a drop of 200 million people in poverty. There are still an estimated 700 million people — 11 percent of the world’s current population — living in extreme poverty (as of 2013). This steady decline may not yet be a cause for celebration but it is a reason to hope and continue to chip away at poverty and its effects. Americans — especially younger ones — feel urgency surrounding poverty. Nine out of 10 (91 percent) are troubled when reminded of the great number of people who do not have access to clean water, sufficient food, clothing, shelter or basic medicine. 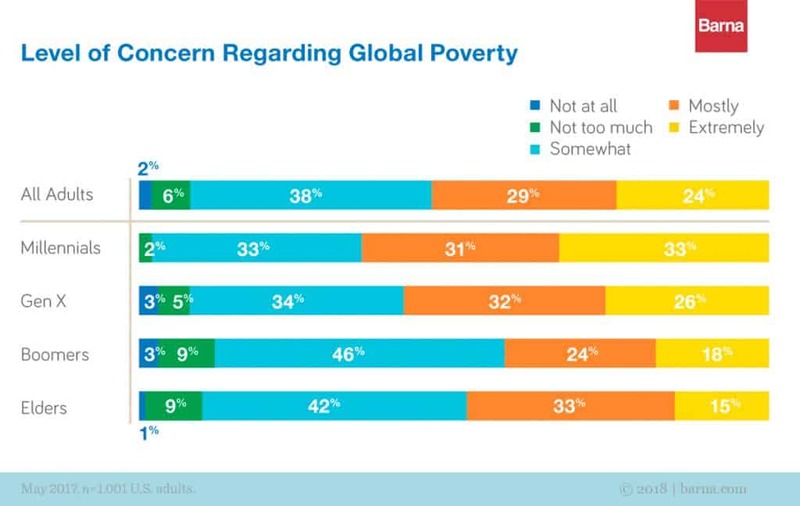 One-fourth (24 percent) selects an “extreme” level of concern for the those in poverty across the globe. Barna found that compared to the general population, Christians are similarly unaware that international poverty is improving. But regardless of their understanding, the faithful consistently report a concern for it. The vast majority (94 percent) are at least somewhat concerned, one-third “extremely” so (34 percent), consistent with percentages in 2011. 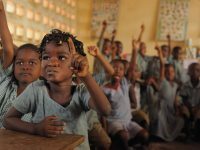 After all, Christians have had good teachers: As long as there has been a Church, addressing poverty has been a focus of its texts and its programs. 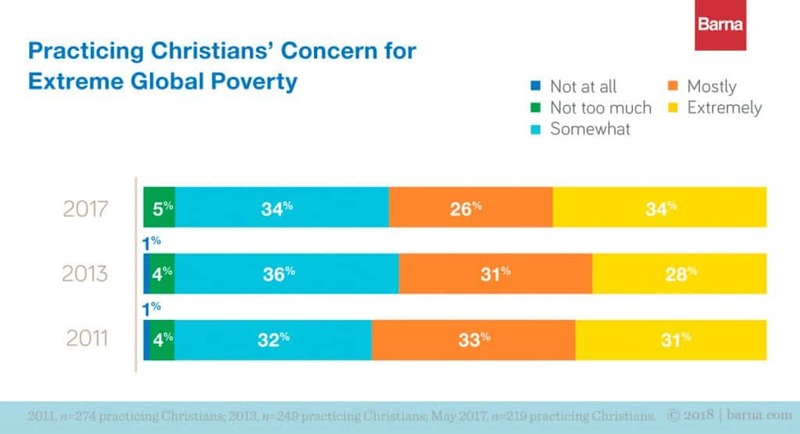 Christians’ sensitivity to the plight of those in poverty is permeated by positivity, as they are relatively hopeful about their ability to affect poverty. A majority (64 percent) feel they personally could make a substantial difference locally or for children in extreme poverty (52 percent). 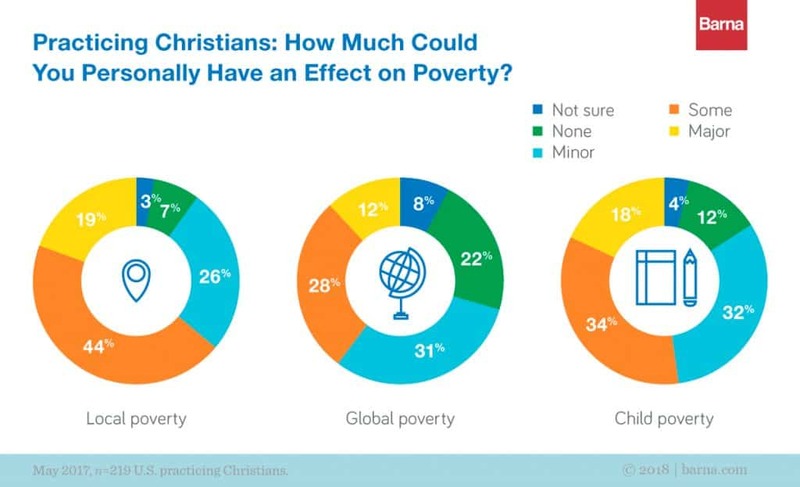 Ambition lags among practicing Christians a bit when focusing on global poverty as a whole: The largest proportion (31 percent) assume only a “minor” impact is possible. When coupled with those who cite “none” or “not sure,” that’s a resounding 61 percent of people who are unclear that they could make a substantial difference. It shouldn’t be assumed that a lack of information goes hand-in-hand with a lack of engagement. Barna found that those who say they have volunteered for or donated to end poverty, globally and locally, are not any more likely to have updated, accurate numbers on poverty. The reassuring truth is that many Americans have eagerly contributed to global poverty’s decline. While the majority of people may believe they can have little to no impact, it’s simply untrue. Those who are contributing time, efforts and financial support to battle global poverty and its effects are making a difference! We see this difference every day in the lives of the 1.9 million babies, children and young adults we care for through our program. The ripple effect of one sponsor investing in one child to address the effects of emotional, spiritual, physical and financial poverty resounds through their families, churches and communities for generations. How much more effective might we be if we embrace the hope behind the facts? If our knowledge that there is something we can do to affect change matched our level of concern? Now that you’re in the know, will you and your church join the fight with us? 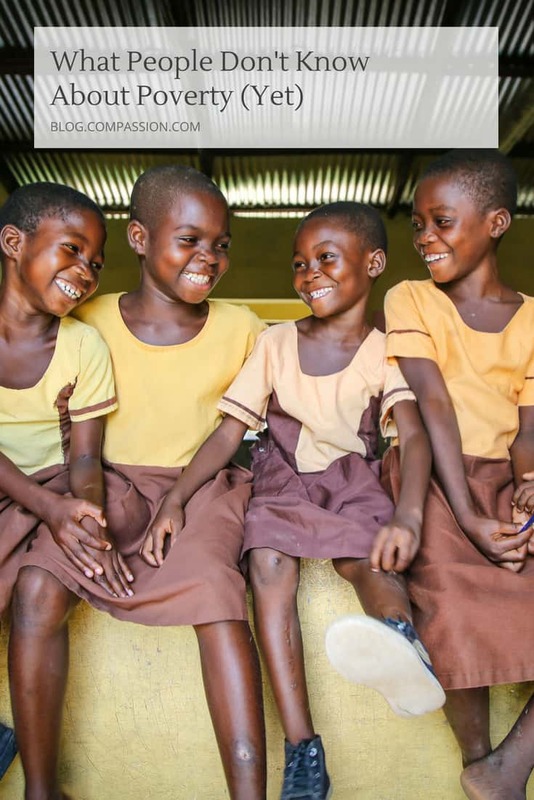 Download a FREE executive overview of The Good News About Global Poverty: What Americans Believe About the World’s Poor — and What Churches Can Do to Help to learn more about how you can take action with your church congregation today! 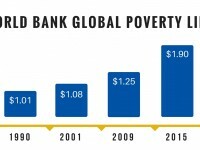 To dive deeper into this compelling new research, you can purchase the full report The Good News About Global Poverty from Barna.com.